This model adopts a unique design with staggered main pipe valve slides, creating a smooth response. 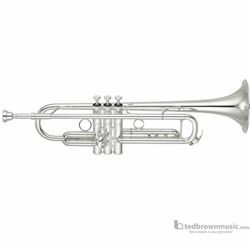 A heavy mouthpiece receiver and daring removal of the third valve water key results in a superb balance of playability and tonal quality. With this model, musicians will be able to produce a firm sound in all dynamic ranges, from delicate pianissimo to powerful fortissimo. The YTR-8335RS achieves smooth resistance and airflow that only a reverse tuning slide design can offer, for easy, comfortable playability and harmonically rich tone.